Government in New Jersey is up to its old tricks: hiring people convicted of crimes, hiring those who are politically connected, and hiring those who don’t have qualifications for the jobs they are paid to do. As always, reporters are having to file complaints and public records requests to get at the truth. There are three new cases where public officials convicted of crimes should have been barred from government work, but were hired anyway, the Associated Press reported. The Associated Press filed a records request to find out if there were any more government employees like Marcellus Jackson, who admitted taking bribes (a federal crime) and was legally barred from government work, but was hired by the Murphy administration as a $70,000-a-year assistant to the commissioner of education. Jackson resigned after news reports of his hiring and a review of his case by Attorney General Gurbir Grewal. Grewal found prosecutors failed to file an order with the courts barring Jackson from state work, and the attorney general promised to see if prosecutors failed to file any other such orders and people were hired. He found three: two former school board members and a court administrator who pleaded guilty to charges related to soliciting and accepting bribes and yet the paperwork for barring them from government jobs was not filed. Former Pleasantville school board member Pete Callaway was hired at a community college and former Pleasantville school board member Jayson Adams was hired as an Atlantic County employee, Associated Press reported. Callaway denied the hiring. Princess Reeves, a former court administrator, was hired to do temporary work for the Passaic County Board of Elections. The three are no longer in those jobs, Associated Press reported. In another jobs scandal, the Schools Development Authority hired 10 people who didn’t meet the qualifications for their jobs, North Jersey.com and the USA TODAY NETWORK reported. NorthJersey.com waited six weeks after requesting job descriptions for the newly hired at the authority and then only received “generic job descriptions.” The agency, which funds school projects, fired two dozen veteran workers and hired 38 new employees, many of them with ties to its chief executive Lizette Delgado-Polanco, vice chair of the state Democrats, according to NorhtJersey.com. “Many of those new employees had personal or professional connections to Delgado-Polanco but did not appear, based on their resumes, to be qualified for jobs that pay up to six figures,” Dustin Racioppi reported. “Some didn’t have college degrees. Others lacked professional accreditation. Or even relevant work experience. One didn’t have a driver’s license.” An authority spokesman, however, said those hired were “highly qualified for their positions.” The situation mirrored what happened under Gov. McGreevey when Democrat Susan Bass Levin headed the Department of Community Affairs and restructured the New Jersey Housing and Mortgage Finance Agency where 26 were fired and 38 hired much of it based on political affiliation with questions raised about the qualifications of the new hires. In the housing authority case, employees, who said their First Amendment rights were violated, won a $1.25 million settlement. Charter schools in New Jersey have been a lifeline for parents in urban areas hoping for a better life for their kids. One third of the students in Newark attend charter schools, and the number of charter schools in the Soprano state is expected to grow to 30 this year, according to northjersey.com. The system educates 50,000 with 35,000 on waiting lists. But an investigation by northjersey.com and the USA TODAY NETWORK revealed a significant waste of taxpayers’ dollars as a result of flaws in the 1996 law that set up the charter school system. It is another example of a good idea gone awry because of Soprano state politics. According to the northjersey.com investigation, the law did not provide a way for charter schools to finance their school buildings. Why? To avoid controversy with the New Jersey Education Association, the powerful teachers’ union, and others opposed to the charter school idea. The result, according to northjersey.com: the diversion of millions of dollars (local, state and federal tax dollars) to private companies that control the real estate for charter school buildings. “What that means is that millions of your tax dollars are being siphoned off by private interests to pay for buildings, often without your knowledge, that you don’t own,” northjersey.com reported. Rents exceed building costs. The public doesn’t own the buildings. The state provides little oversight. The charter school investigation comes on the heels of another probe by northjersey.com and USA TODAY NETWORK which revealed that the Schools Development Authority, which manages $11 billion in public school construction and whose head Lizette Delgado-Polanco is vice chair of the Democratic State Committee, fired 26 employees, many of them veteran employees, and hired 38 new people, many with connections to Delgado-Polanco or her family. The pay raises Newark City Council handed themselves for part-time jobs were so outrageous the Soprano state made the news in Texas, North Carolina, and Kansas. Associated Press picked up the nj.com story, and folks in far-flung places must have shook their heads in amazement. Newark City Council voted to increase its own salaries by more than $30,000, NJ Advance Media reported. Council President Mildred Crump’s salary went from $71,000 to $105,000. The salaries of eight council members grew from $64,000 to $95,000. Adding insult to injury, the raises are retroactive to July. Five members voted in favor of the raises. Two others arrived late for the vote, but registered a “no” vote with the clerk, nj.com reported. The two voting “no” told nj.com it was too much money for a part-time job. Council recently raised the salary of Newark Mayor Ras Baraka by $50,000 from $130,221 to $180,000. Council also gave Baraka the option of taking a $30,000 allowance instead of filing for his expenses. The new salaries for council members included expense accounts of between $12,000 and $14,000. The city clerk said it was the first council raise since 2006. Gov. Murphy wants to know who was hired or promoted at the state’s 50 authorities over the past three years and whether those hired are related to anyone else in state government. Government authorities in the Soprano State have long been patronage pits and ways of getting around the need to ask taxpayer permission for bond issues. (See Chapter Seven of The Soprano State where we call authorities “burying grounds for deadwood and unemployed relatives.”) The governor’s action comes on the heels of the newest authority scandal uncovered by the USA TODAY NETWORK New Jersey and reported by The Record. The Schools Development Authority, which manages $11 billion in school construction and whose head Lizette Delgado-Polanco, vice chair of the Democratic State Committee, was appointed by Murphy, is under fire for getting rid of 26 employees, many of them veteran employees, and hiring 38 new people, many of them with personal connections to Delgado-Polanco or her family, The Record reported. An investigation by USA TODAY NETWORK New Jersey found among the new hires were the mother of Delgado-Polanco’s grandchild, 10 people connected to the unions where she used to work and a friend of her daughter. The authority defended the new hires by saying all were highly qualified but did not provide job postings or descriptions to the Record. The report was fuel to Senate President Steve Sweeney’s push to eliminate the authority and move its responsibilities to the state Economic Development Authority. It would not be the first time the state agency in charge of school construction was dissolved because of scandal. The Schools Construction Corp., charged with spending $8 billion to upgrade schools in the state’s poorest districts, wasted millions of dollars before it was replaced in 2007 by the Schools Development Authority. The authority was rocked by scandal earlier in the year when questions were raised about the hiring of Al Alvarez as the authority’s chief of staff when he had been accused of sexually assaulting a woman on the Murphy campaign. Alvarez was the one who fired the veteran employees before resigning, The Record reported. He now faces a subpoena by a legislative committee to explain the firings. Delgado-Polanco is paid $225,000 a year. The governor won’t have to go far to find her relatives in state government, The Record reported. Her daughter, Brianna Earle, is his director of public engagement and is paid $110,000. Delgado-Polanco’s husband, Enohel Polanco-Gonzalez, was hired by the state Education Department at a salary of $95,000. Bridgegate conspirator Bill Baroni, former Port Authority deputy executive director, will spend 18 months in federal prison for his role in closing the Fort Lee Lanes to the George Washington Bridge to punish the mayor for not supporting Gov. Christie’s reelection. The sentencing judge U.S. District Judge Susan Wigenton called Baroni’s behavior “an outrageous display of an abuse of power.” Baroni told the judge he did it for Christie. “I wanted to please him,” Baroni said. “I got sucked into his cult and culture.” Therein lies the heart of the matter. 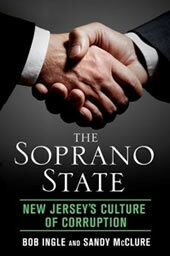 That’s why we called it The Soprano State, New Jersey’s Culture of Corruption. The culture of corruption that has plagued Trenton and the state continues on. Baroni said he was sorry for what he did. He said he thought he knew the difference between right and wrong, but that changed when he went to work for the Port Authority and Christie. A former state senator, Baroni called himself a broken man. He has been doing volunteer work in New York City for LGBT children and immigrants, but the judge said that did not change the facts in the case. In addition to the prison term, she sentenced him to one year of supervised release, 500 hours of community service, fined him $7,500 and ordered him to pay restitution of $14,314. Convicted in the case with Baroni was Bridget Anne Kelly, Christie’s former deputy chief of staff, who is appealing her case to the U.S. Supreme Court. The U.S. Court of Appeals upheld five of the seven counts in the conviction of Baroni and Kelly. The appellate court dismissed counts related to civil rights conspiracy. For that reason, Wigenton changed Baroni’s sentence from 24 to 18 months. The lane closure scheme was planned for the first day of school, meaning school buses, commuters, ambulances and fire trucks were stuck in the traffic jam. The conspirators agreed to disregard the pleas from the mayor and others about the traffic jam’s risk to public safety, according to prosecutors. The conspirators also concocted a sham story about the lane closures being a traffic study, and Baroni went so far as to testify about the bogus study when he appeared before a state legislative committee investigating the closures, prosecutors said. Bridget Anne Kelly, Gov. Christie’s former deputy chief of staff convicted in the Bridgegate case and famous for her email, “Time for some traffic problems in Fort Lee,” is looking to get out of her jail-time sentence and intends to take her last option, an appeal to the U.S. Supreme Court. The letter of intent, filed by her attorneys, comes after the U.S. Court of Appeals refused to take a second look at the case. A panel of judges from the U.S. Court of Appeals upheld five of the seven counts in Kelly’s conviction. Kelly’s lawyers argue what she did was mere politics because there was none of the traditional bribes often seen in the Soprano State. But a jury, and the U.S. Court of Appeals, disagreed. Bill Baroni, the Port Authority executive convicted along with Kelly, has given up his appeals and has asked the judge to resentence him, based on the five counts upheld by the appellate court. A jury found Kelly and Baroni guilty of wire fraud, wire fraud conspiracy and misapplying property of an organization receiving federal funds. They were convicted of closing the Fort Lee lanes to the George Washington Bridge in a scheme that prosecutors said was aimed at punishing the mayor for not supporting Christie’s reelection. Planned for the first day of school, the lane closures meant school buses, commuters, ambulances and fire trucks were stuck in the traffic jam. The appellate court dismissed counts related to civil rights conspiracy, but focused on the use of federal funds for the scheme, ruling “to execute their scheme, they conscripted 14 Port Authority employees to do sham work in pursuit of no legitimate Port Authority aim.” Baroni was sentenced to 24 months, Kelly to 18 months. They are free, pending appeal. Kelly testified Gov. Christie knew about the scheme, something he denies. For 103 years local officials from the Soprano State have poured into Atlantic City for the annual League of Municipalities conference where hundreds of thousands of taxpayers’ dollars were spent last year on the likes of a $30 omelet, a $300 limo ride and a $1,063 meal, the North Jersey Record reported. The Record tabulated that during the three-day conference, $378,000 was spent by local officials from Bergen and Passaic counties and parts of Morris and Essex counties. The annual gathering was defended by Micah Rasmussen, now director of the Rebovich Institute for New Jersey Politics at Rider University. Rasmussen is the former press secretary for Gov. Jim McGreevey. Rasmussen is the aide who constantly went to the mat for McGreevey and who McGreevey during a legislative correspondence club speech jokingly compared to Baghdad Bob, the Iraqi Minister of Misinformation. (See Chapter 2 of The Soprano State.) “There are lots of opportunities to work hard, and a lot to play hard,“ Rasmussen told The Record, which found only 37.6 percent of the officials used their badges to attend classes on municipal issues. Cliffside Park officials spent more taxpayers’ money at the conference than any other town, $17,791 for 22 officials, including a limo ride, taxis and expensive meals, with one councilman’s meal costing $1,063, according to the Record investigation. Only four Cliffside Park officials swiped cards to record their attendance at a class. A spokesman said they might not have swiped, but they listened and took notes. What really can get dicey are the after-hours events of receptions, breakfasts, cigar nights and liquor tasting sponsored by law firms and engineering companies. Companies are looking for municipal business. And sometimes the feds are looking too. For more than a decade it has been known that the feds have used the after-hour events at the annual conference for sting operations. The feds indicted one of New Jersey’s party bosses, Ocean County GOP chair George Gilmore, identified in The Soprano State (Chapter 3) as a lesser boss who operates behind the scenes, but who has been key to any Republican winning statewide. A federal grand jury charged Gilmore with more than $1 million in tax evasion and with failing to turn over taxes collected from the employees of his law firm. Federal prosecutors said Gilmore owed the IRS $1.5 million by the end of 2016, while between 2014 and 2016 he spent more than $2.5 million on home remodeling, Colorado vacations, antiques, artwork, and collectables, including animal tusks. His lawyer, white collar crime defense attorney Kevin Marino, attributed Gilmore’s woes to a hoarding disorder and pledged his vindication. The charges accuse Gilmore of concealing information from the IRS, falsely classifying income, making false statements to the IRS, filing false tax returns, and understating his income from his law firm. County GOP chair since 1996, Gilmore is a partner in the law firm of Gilmore & Monahan and counts among his clients numerous New Jersey municipalities where the feds have been poking around for years. The indictment reads like a true Soprano State story. Gilmore is accused of using the law firm’s bank accounts for $2 million in personal expenses. He also is charged with paying back taxes with a $493,000 check to the IRS that bounced because he only had $2,500 in the account. In the two months after he wrote the check (and after he was told it bounced), the feds accuse him of spending more than $80,000 on personal items that included art work and antiques. Gilmore was responsible for withholding federal payroll taxes from his law firm’s employees and is charged with collecting the taxes, but not fully turning them over to the IRS. He also is charged with making false statements on a loan application to Ocean First Bank. Without disclosing his outstanding taxes and other debts, he refinanced a $1.5 million mortgage and received a $572,000 cash out, which he did not use to pay his back taxes, the feds charge. Republicans stood behind the powerful chairman with Freeholder Jack Kelly saying it was too early to suggest Gilmore resign his post. “Just because the government has put together a case doesn’t mean it’s the truth,” Kelly told the Asbury Park Press. Jim McGreevey has been accused of acting as a lawyer without an active law license and has been fired as head of the Jersey City job training and prisoner re-entry program. Wherever the former governor goes in public life, controversy eventually seems to follow. McGreevey resigned from the state's top job in disgrace in 2004 after admitting to an extramarital affair with a man identified as Golan Cipel, the unqualified Israeli McGreevey hired as the state's security advisor. (See Chapter 2 of The Soprano State for all the details.) For the past six years, McGreevey led the Jersey City Employment and Training Program at a salary of $119,000 a year. But he is now in trouble with Mayor Steve Fulop and the nonprofit's board of directors, who are appointed by Fulop. Sudhan Thomas, chair of the board, has described McGreevey's decision to act as a lawyer for the agency when he does not have an active law license as "disturbing" and a "huge exposure" to the city, the Jersey Journal reported. McGreevey told the newspaper his goal was to save money. And there are other problems. In October, the city withheld federal money from the program, and city business administrator Brian Platt defended the decision by saying the training program was not compliant with rules on cash spending, did not provide proper job placement for clients and did not do required reporting, the Jersey Journal reported. At the same time it fired McGreevey at a meeting where no reasons were given, the board hired a lawyer and an auditor to review the program's finances. McGreevey's lawyer, high-profile defense lawyer Michael Critchley, sent a letter to Fulop threating to sue if McGreevey was fired at Fulop's direction, the Jersey Journal reported. NJTV News reported McGreevey is claiming he deserves protection under the state's whistleblower law because his woes with the program are a result of his firing a political operative who admitted taking cash from program clients after he helped them get jobs. In typical McGreevey style, he invited friends to attend the meeting where he knew he was about to be fired and emphasized he's a local by saying he works with clients from the neighborhood of his parents and grandparents. The board voted 5-3-1 to fire McGreevey despite "pro-McGreevey testimonials from nearly 30 people," the Jersey Journal reported. Bill Baroni, the Port Authority executive convicted in the Bridgegate scandal, is ready to face jail time. Baroni's lawyers signaled they will no longer appeal a federal appellate court decision upholding convictions of wire fraud, wire fraud conspiracy and misapplying property of an organization receiving federal funds. Baroni and Gov. Christie's former deputy chief of staff Bridget Anne Kelly were convicted of closing the Fort Lee lanes to the George Washington Bridge in a scheme that prosecutors said was aimed at punishing the mayor for not supporting Christie's reelection. The appellate court dismissed a count of civil rights conspiracy for each defendant while upholding the other charges. The appellate court noted that "to execute their scheme, they conscripted 14 Port Authority employees to do sham work in pursuit of no legitimate Port Authority aim." Baroni was sentenced to 24 months, Kelly to 18 months. The appellate court ordered U.S. District Court to issue new sentences, based on the dropping of the civil rights charges. Kelly's lawyer, high-profile defense lawyer Michael Critchley, vowed to take her case all the way to the U.S. Supreme Court. For the first time in at least 10 years, the New Jersey State House Commission stripped a judge of her pension. The state Supreme Court booted Superior Court Judge Liliana DeAvila-Silebi from the bench after investigators said she made a bogus phone call to police to help an intern win custody of her child. DeAvila-Silebi informed police about a court order that didn't exist, investigators found. The high court ruled she misused her position to help the intern, made false statements under oath and altered telephone records to cover up her actions. Sen. Gerald Cardinale, a commission member, told the North Jersey Record, "What's striking is that she continued to provide cover stories as time went on. There's no respect for the law." What also is striking is that only four of seven commission members thought her pension should be stripped. Here are the three who voted for her to keep her pension: Sen. Bob Smith, Justin Braz (the governor's deputy chief of staff for legislative affairs) and David Ridolfino (acting director of the Office of Management and Budget).